4 x 10 High Output Maple Flush Mount Register Discounts Apply ! Your maple floor registers are designed to be a flush mount installation, for a clean look. These wood heat register covers can be stained or left with a natural finish. 4 x 10 maple floor register has a steel damper that can be adjusted for your level of comfort. 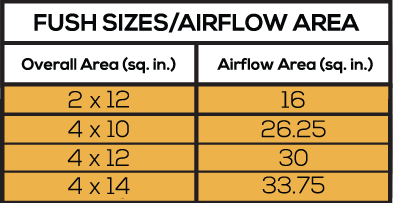 Because these wood heat register covers are high output, they offer 30% more air flow throughout your home. Flush mount maple floor registers are designed to be installed when the floors are put in. 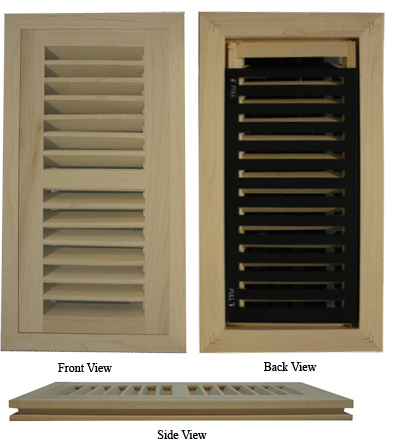 Maple wood heat register covers are an American made product. Maple floor registers are excellent for heating and cooling. ***Hint: When ordering maple floor registers the industry standard is to order using the hole size, order vents according to the closest match to the hole in your floor. Wood heat register covers need to be installed the same time as the floor is installed. *Flush mount air vents in 5/8" or 1/2" thickness can be special ordered. Call for pricing and availability. Wood heat register covers can also be purchased as a drop-in style if your floors are already installed. We do offer wood floor register covers in other sizes and wood species. Flush mount maple floor registers are quality made in America. Be sure to place your order today!